I’ve recently enjoyed taking a few dog/cat commissions (and some just for fun). Here are a few in pencil, watercolor, and ink. Kaleb Schad wrote and created the art for the novella Just Anaz, that can be read for free on the website ( http://justanaz.com ). Or it is available for purchase in print or digitally at Amazon ( https://goo.gl/vHXnNX ). It’s a worldly tale of a young man forced into an impossible situation. Through continued practice and sacrifice (much like the protagonist in Just Anaz), Kaleb Schad is good at near everything he decides to do. Including setting a good example of hard work for his two boys that he dedicated Just Anaz to. But Kaleb doesn’t stop to just be good, he’s constantly bettering himself, always painstakingly striving to be that great father, husband, co-worker, artist, writer, and more. He’s even a black belt in Tae Kwon Do and studies Brazilian Ju Jitsu two days a week when not suffering from a lingering neck injury. During childhood stints in WI and Montana, his dad introduced him to Taoism and Buddhism early through the book the Tao Te Ching. They are Christians, but also open to new ideas and those combined ideologies helped shape Kaleb’s creativity and open-mindedness. He earned an English and a public relations major in Stevens Point, WI, but also studied philosophy at the University. Committing to how he chooses to live, some common things many people do, Kaleb casually and quietly forgoes. It was’t prideful or boasting when I had to pry out of him what he gives up. He’s not up on, well, many of the more popular television programs of the time. In fact, although his home work studio is full of books, and some movies and video games; looking closer, there isn’t much pop culture at all from the last decade. Framed early Todd McFarland Spider-Man and Spawn comics fill the walls. Lots of Akira Manga (Japanese comics) and Anime (Japanese animation) stock the shelves. And although meticulously organized, his Magic: The Gathering cards have a purposeful touch of dust on them. However concept movie art books, as well as anatomy and perspective drawing books are some of the newer and often referenced material in his studio. Kaleb copied the entire Figure Drawing For All It’s Worth book by Andrew Loomis as a training artistic exercise. He even gives up his dinner for his creative passions. Kaleb often fasts while taking life drawing at the Richeson Art Gallery or on his martial arts training evenings. Again in a very honest unassuming way, he just tells me there isn’t time, and wolfing down unhealthy food for speed isn’t very Kaleb-like either. (Save a soft spot for doughnuts.) Fasting is another very conscious attempt to test/better himself. Limiting his sleep was another casualty of creating Just Anaz and his other creative pursuits. Trying to work evenings proved too tricky for the family man and his full time creative director position chews up his weekly daytime. So Kaleb instituted for himself a daily 5:00-6:30am work period when no one else in his Ashwaubenon home was awake. That 90 minutes is his creative time and he makes the most of it. Writing without distraction, even when it was hard, was how Just Anaz went from a cool idea, to an ambitious accomplishment. After an early auspicious start as part of a Dungeons & Dragons campaign, Just Anaz further gelled for Kaleb when he started asking some tough questions in his own life. “What makes someone a good person?” or “What’s a good life in a challenging situation?” Specifically thinking about his children as they become young men, he wanted the story of Anaz to be something that might spur those types of questions, beyond mere escapism. Just Anaz is intentionally more than just flashy, childish fare. The imagery in Just Anaz did take a substantial amount of time to create. It was drawn first with blue lines, then pencils, followed by digital scans and manipulated with a Wacom Tablet on a Mac. But the writing, Kaleb explains, actually took much longer. It was countless hours of notes, outlines, character development, research, rewrites, sharing a little prose with people he trusted for feedback, then round after round of tweaking the writing to his liking. The book itself is a mix of genres that sticks with you long after a page-turning read. The character Anaz is a gifted everyman. He’s suffering, yet most people around him have it much worse. It’s a bleak world, with glimpses of hope. And a young woman thrust into the mix heightens an already exciting story. Kaleb’s next project is a science fiction story that he’s quite excited about, but he’s not ready to share many details with us just yet. He plans to illustrate it in a similar style as Just Anaz, and it can’t get here soon enough! Here is a mocked up t-shirt design I did for the dark, interesting, and eerie podcast Here Be Monsters. The illustrated monarch wing, bat wing, and ant elements come directly from the many strange topics the Podcast discusses. For a listen go here. I find the Hale Bop cult (episode 43), hitchhiking (episode 61), and the sasquatch (episode 25) stories particularly noteworthy. Below are 14 character sketches I’ve drawn based on the television program The Office (American version). They were created on an iPad Pro with a digital pencil. Many of these were originally posted on my Instagram account here. I’ve had the honor (and pleasure) of serving as the graphic designer for the AAF Fox River Ad Club this year including event posters, AAF Facebook imagery, eBlasts, flyers, and other collateral. Below are 8 of the found clip-art retro-ish posters. Space-5.com is a new webcomic by Blayne Belter and Nick Devos. This is a quick chat with Blayne. Shawn Williams: Space-5.com is a new webcomic you are collaborating with Nick DeVos, tell us what it is about? Blayne Belter: It’s an all ages comic (fun for kids and adults alike) about space travel and being lost. Our adventurers are trying to find their way back home to earth. SW: What made you want to create webcomics? BB: I’ve always wanted to create a story start to finish. Learning a bit about creating websites made me want to make something more custom that stood out a bit from the webcomic crowd. Also, it is free to publish and delivering content is pressure free! SW: Why an all ages space theme? BB: So much story telling freedom because so much is unknown. Always loved Star Wars and Marvel comics as kids. So we hope other kids can’t get enough of it like we couldn’t. You can hit on the science fiction aspect without being science specific. SW: I have been told Blayne Belter knows funny, should we expect humor in Super-5? BB: No you shouldn’t. This is a straight forward story, featuring boredom as the main theme. SW: I understand on this webcomic you’ve done extensive character studies, do you want to tell us about your process? BB: We started with the names. All of our characters are named after historic scientists and inventors. From there we gave them archetypal traits and they have been falling into place with ease as we have been creating dialogue and story. SW: As well as a talented illustrator/comics creator you are a professional graphic designer? How do those skills translate to creating art into comic book formats? BB: All of it. I would say this project is 50/40/10. 50% story creation and weaving it from episodical, while keeping an over arching bigger story from start to end. 40% design (web site design and user experience forethought consumed my life for over a year). I design the episodes/comics more than I illustrate them. I could do them by hand, but the need to crank content helped me decide to design a method for being able to do original art as well as make things quicker (day job takes 1st place). Designing and sequential art (comics) are so similar. Most of the time it is about delivering a message as simple as possible allowing images to say the words you don’t write. You start from the top left and end at the bottom right of your page. I will, and have, been placing a lot of power on color to set tone, placement and mood. Aside from design this is so much more personal to me. I like advertising design, but story telling is what I love. I think the only difference is where you hang your heart. 10% educational/message delivery. Our main audience is children so we want to deliver positive messages. As more chapters/ episodes/comics are produced our themes will come out more. They aren’t pound you over the head themes, but it is all about doing the right thing and understanding differences in the end. Coming together to accomplish big things. Good stuff! SW: Do you consider yourself an artist that writes, or a writer that draws? BB: Wow. I have friends that can draw the pants off me (literally, they would make it look hilarious). I think it is more fair just to call me a story teller. SW: What direction do you see the sequential art medium moving in? BB: I think print and web are doing great. I think the original story telling is getting bigger and bigger. The big guys like Marvel and DC and their off shoots will always be fine, but the promotion Image has done to new content and some of the excellent web comics out there have played a huge role in getting other people involved. There really is something out there for anyone and everyone! SW: What are you reading these days? BB: Walking Dead… always. Thanks Dave at Powers Comics for starting me on it 10 years ago. I just started rereading Bone by Jeff Smith, because I love it and I have the whole Scholastic collection in color. Before that I reread Barry Ween by Judd Winnick. The last stash I bought was Afterlife with Archie (pretty good so far) and finished up my run with Batman and the great Scott Snyder and Greg Capullo. Saga is always a favorite too. OK. I have too many. SW: And last but not least, when have you laughed the hardest? BB: When a junior high school friend of mine lit a fart at my family cottage. Bring Your Lightsaber To Work Day – Friday!! Just for fun, grab your (or your kids) toy lightsaber and have an epic lightsaber battle in the office… Why not? Friday, 12-18-15. This is also, as you know, the official release date of the Star Wars film The Force Awakens – of which I’m totally jazzed to see!! Please I don’t want to hear about anyone getting in trouble or injured… Just use your Jedi training wisely and pick a lightsaber duel with your coworker!! Check out this nutty animated GIF I whipped up for said event! My friend is running for Town Clerk in the community outside New London, WI, and I helped make these simple signs. Vote for Heidi! I have just completed a really cool graphic design request they are going forward with – a refreshing new logo design for the Joel Nefuma Refugee Center in Rome, Italy. Their site is here and their Facebook page is here. One of most exciting things about design and illustration work is seeing your art disseminate all over the world into places you may never expect. And the opportunity to create work for this non-profit organization that has a large, honorable purpose – well that is what life is about. Listening to the stories, and meeting the people involved with the JNRC has been so inspiring. I am so glad I could be associated with this organization. The logo design itself comes out of several discussions with Jill Drzewiecki as well as research on JNRC itself. The ‘upside-down’ earth image is an idea from Jill herself, suggesting that the Northern Hemisphere on ‘top’ of the world doesn’t necessarily represent how the earth could have been presented. What if maps and globes were all flipped – which could just as easily have been the case? Looking at things without preconceived notions is part of a larger philosophy of the JNRC. National identity, personal identity, relating to others… these concepts can and perhaps should be challenged, but ultimately the need to make the world a better place should be an end goal, regardless of ones past. What I mean is that offering a non-traditional view of the world is certainly different, but it is also correct. A different view is a valid way to see things, even if it is new or just never seen before. The color palette of the logo is a dark blue and a green, they are colors intentionally not strongly associated with any particular country, as the JNRC proudly accepts everyone through it’s doors. The simple hands around the earth are a semi-universal sign of hope and are a common element in peace keeping iconography. And just for fun I thought I’d share (at a very small size) some of the logo iterations we went through before coming to the new logo. 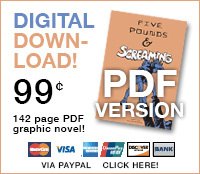 FIVE POUNDS & SCREAMING on the Kindle!